While I am at it might as well put the core list up on the very first page. Many still have this past seasons deals but those links will get updated and eventually get reposted here in any case multiple times. However I will update this as new things pop up so people will not have to dig. St Pat's, Valentives Day, Super Bowl Sunday, April Fools Day - Someone will post a list I am sure. Killington - Express Pass with 50% off midweek and 25% off on holidays and weekends plus after every 6 uses you get a free day - free for veterans. Price generally discounted preseason. Look for resorts that have good Sunday half day deals like Okemo ($29 VT/NH), Burke ($25), Bretton Woods ($25) etc. Will post more about this later. I am a cell phone neophyte, while traveling can you buy a lift ticket from Liftopia and use your cell phone as proof of purchase or do you have to have access to a printer to print POP? Depends on the mountain. Many (most?) allow you to use your phone. I have always used my phone. They just need the number off the confirmation. The survey is simple and I did it three times. Cell, Tablet, Desktop each time a different email. That's a pretty good deal for Sugarloaf. Sugarloaf deals are hard to come by unless they involve lodging. 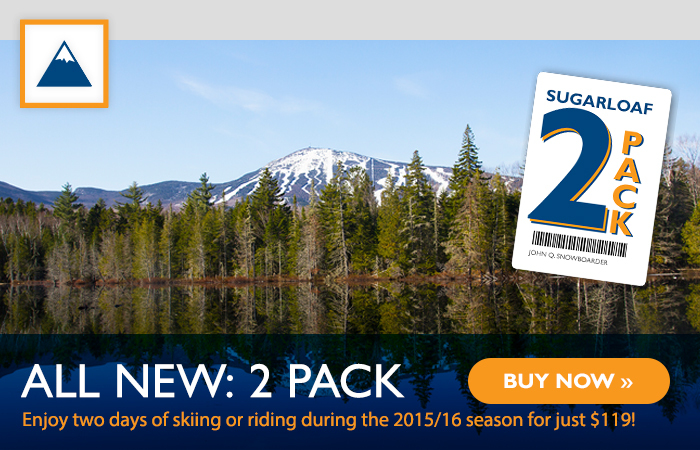 Loon has the same 2 for $119 deal through 6/22. Tomorrow (6/11/15) is the last day to get early season pricing for Killington season pass products (excluding college pass & VT. Student pass).